The core is committed to transmission electron microscopy of samples larger than 250 KDa, with the goal of image reconstruction at better than 1nm resolution. The facility’s three electron microscopes provide a progression of capability, from the Tecnai Spirit for initial screening of negative-stained samples, to the Tecnai F20 for preliminary electron cryomicroscopy, to the advanced Titan Krios, which is dedicated to automated data collection for high-resolution analysis. At this time, the MEMC is not providing data analysis services. However, some guidance and suggestions are available. Trained researchers can use microscopes themselves. Alternatively, MEMC personnel can assist researchers in collecting images. Please contact Kelly Dryden (kdryden@virginia.edu) to discuss how best to use the facility to aid your project. A project application will be required, at which time access to the scheduling system will be provided. Clients will need to provide a 1Tb-4Tb USB storage drive for multi-day data collection on the Titan Krios. Images collected on the Spirit or F20 will accessible by download from a remote server. 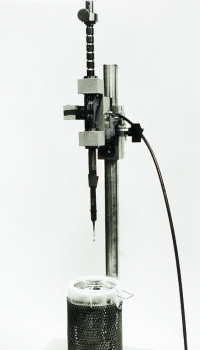 Researchers can freeze samples manually in liquid ethane or using an FEI Vitrobot. Several options are also available for negative-staining. Typical sample requirements are 3 µL at concentrations of 0.1-1.0 mg/ml. American Laboratory recently published an introduction to cryo electron microscopy for structure determination. Some use this technique to study proteins in membranes. A 2014 review in Science (10.1126/science.1256358) by Smith and Rubinstein describes how direct electron detectors can resolve helices and beta strands with resolution of less than 4Å for some samples.